On Tuesday, U.S. News &World Report named Hawaii’s southernmost island the 2018-19 Best Winter Vacation spot in the world, beating out 19 other locales on the list of the top 20 global destinations. Travelers and U.S. News &World Report editors alike ranked the Big Island No. 1 winter vacation destination for its “warm weather and excellent surfing conditions.” West Hawaii Today. Civil Beat Poll: Voters Want Term Limits For State Legislators. They also support an initiative process, all-mail voting and a lottery. But forget about legalizing pot. Civil Beat. Civil Beat Poll: Voters Like The Idea Of A ConCon, They’re Just Not Going To Vote For It. There is significant support for the idea once it’s explained, but that support has decreased from previous polls. Civil Beat. State prepares for new medically assisted death law to take effect. The state Department of Health is urging health care organizations to prepare for the new law that permits terminally ill adult residents with six months or less to live to obtain a prescription for medication to end their lives. Star-Advertiser. The Hawaii Department of Health is telling healthcare organizations statewide to prepare for the Jan. 1, 2019, effective date of the Our Care, Our Choice Act, which allows adult residents with a medically confirmed terminal disease and less than six months to live the choice to obtain a prescription for medication to end their life. Maui Now. Gov. David Ige lent his political weight Monday night to a proposed constitutional amendment that would allow the state to tax investment properties to support public education, while also promising to veto any resulting bill that might raise property taxes for owner- occupied homes or increase rents on affordable housing. Star-Advertiser. Congressional District One: Republican Cam Cavasso. The Republican Candidate for the Congressional District One seat, representing urban Honolulu, is a veteran politician. Hawaii Public Radio. DOH employee questions medical marijuana quality, policies for checking it. Is the weed you need in Hawaii clean and safe? An employee of Hawaii's Department of Health, who wishes to remain anonymous, says no. KITV. How OHA Trustees Spent Their Allowances. Thousands of dollars went to support athletic competitions, charitable galas and beauty pageants. Civil Beat. A United Nations scientific panel on Climate Change released a report earlier this month that warned of a worsening crisis by 2040. Here in Hawaii scientists have been raising the red flag about global warming and sea level rise and the need to deal with protecting our natural resources. Hawaii Public Radio. Nine members of a Southern California drug trafficking ring accused of disguising methamphetamine as decorative Aztec calendars and statues to ship the drug to Hawaii are behind bars, federal authorities said today. Tribune News Service. The hotel strike on Oahu and Maui could put a damper on two high-profile group events coming to Hawaii this week, including Waikiki’s largest convention of the year. Star-Advertiser. No negotiations planned as Marriott hotel worker strike continues. Pacific Business News. Record number absentee ballots mailed on Oahu. The Honolulu County Clerk's office mailed 164,000 absentee ballots Tuesday. KHON2. Office of Elections looking to fill over 300 volunteer positions for General Election. Twenty-days until the General Election, over 300 volunteers needed. KITV. Major portions of Ala Wai Community Park and next-door Ala Wai Neighborhood Park will be closed for maintenance through Dec. 26. Star-Advertiser. Honolulu has been ranked as one of the 10 greenest cities in the United States, according to a new report. Pacific Business News. Waikiki’s last lei stand could be revived if an ‘experiment’ goes well. Hawaii News Now. Hawaiian Humane Society opens community clinic for spay, neuter services. A ‘high-quality, high-volume’ sterilization clinic for pets on Oahu has been opened by the Hawaiian Humane Society. Hawaii News Now. Brenda Carreira is set to become the latest in a line of administrators to try to repair Hawaii County’s beleaguered Mass Transit Agency since Mayor Harry Kim assumed office in 2016. West Hawaii Today. A bill regulating vacation rentals took a big step forward Tuesday, clearing a council panel on its way to two final votes. West Hawaii Today. Puna Councilwoman Eileen O’Hara introduced a resolution Tuesday recognizing animals as “sentient beings” but quickly withdrew it because of lack of support from other council members. Tribune-Herald. A striking employee was put in handcuffs and banned from hotel grounds for one year after passing out leaflets to guests informing them of the strike at the Sheraton Maui Resort & Spa, according to the union that represents the workers. Maui News. UNITE HERE Local 5 has filed an unfair labor practice charge against Sheraton Maui, alleging violations of federal labor law against three Sheraton Maui employees. Maui Now. 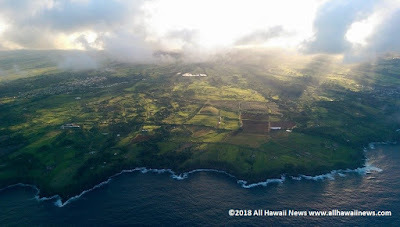 Malamalama Maui launched its final campaign, “36,000 Acres. 36,000 Hearts.” to engage 36,000 people—approximately one for every acre of the previous sugarcane lands—in sharing a message, vision and/or solution from their heart for the future of the Central Valley. Maui Now. Kauai County Council Elections Shaping Up As A Free-For-All. The winners must deal with several looming issues, including combating climate change, worries over the relentless growth of tourism and maintaining the island’s rural lifestyle. Civil Beat. While those caught using tobacco products at two county parks can now face fines, the tobacco-free status is more about changing society’s views than issuing citations. Garden Island. Four Newell’s shearwater birds were released at the Kamalani Playground at Lydgate Park Tuesday in the annual Releasing of the 'A'o. Garden Island.